A day Rhodes, Greece... Of course, photos of the day are continued in the folder 'Cruise'! Our day started with us docking in at Rhodes. It was a very smooth docking! 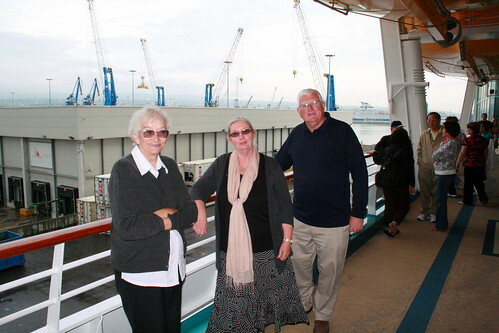 We then headed in for breakfast, and a very casual walk around the deck, before our 10.30 departure for the tour. We drove along the coast up to an archaeological site about 45 minutes outside of Rhodes. It was a lovely sunny WARM day, and the water here in Rhodes is a wonderful blue colour; both dark and light! When we arrived, I noticed all of the tour coach's up the hill, and thought, oh know! But soon we were climbing up a dirt roadway, leaving a dust trail behind us! Apparently, they get at LEAST 300 days of sunshine a year here, so not much rain at all! BUT, what is even stranger, is that they actually export potable water out to other Greek Islands nearby as he have severe water shortages! Go figure! Anyways, it was a magnificent site, and we were there for about 90 mins. We then re-boarded the bus to the centre of Rhodes itself. this is a city tat has a new city which is built outside of a wall that as the old city within. The old city, is also that of the Knights of St John, the once protectors of the area. We then slowly walked back towards the ship, which from dockside with no buildings blocking it, really is quite impressive! We departed, heading for Kusadasi Turkey, whilst having dinner, (MORE yummy food...) and after dinner, we went to the show which featured tonight, a soloist that sang in both English AND Italian. So, for tonight, farewell, as we have an EARLY start in the morning. After Kusadasi, we are at sea for the following day before arriving in Alexandria Egypt! So we got ourselves all ready for the day ahead, and headed for the Theatre for our departure. We were segrated into our assigned numbers and positioned in blocks within the theatre! Our number '6' was called and off we went on our adventure for the day. We were of to the Olympia Stadium in Athens, the site for the first of the modern Olympics, as our first stop. All of the pictures of course are in my folder! Then, after a city tour, we head slightly uphill towards the Acropolis! After parking and getting our bottle of water, assigned the radios to listen to the guide, we headed up the hill towards the Patheon. It was an amazing ascent, full of marble (highly polished, so caution was needed) as a path! Then started the steps to the summit. It was now blowing an absolute gale (if not stronger) up there which made it slightly unpleasant, but it was ok! There was a lot of restoration works in progress, and scaffolding about the place... You could literally see for miles up there; pity most of it was all the same colour and texture used for the blocks of units! When we got back to the bus, we had a short drive down into the suburb of Plaka, which is still part of Athens, for some lunch and free time to shop. There was a fantastic little strip of shops we walked down with lots of souviners etc, but we first stopped for lunch! I had a club sandwich, with fries and a drink, mum had a baggett, whilst Michael and Julie had a Greek Salad! We had to be back at the bus for a 3.45pm departure. And I think he was counting down the seconds as SPOT ON 3.45pm, we left! 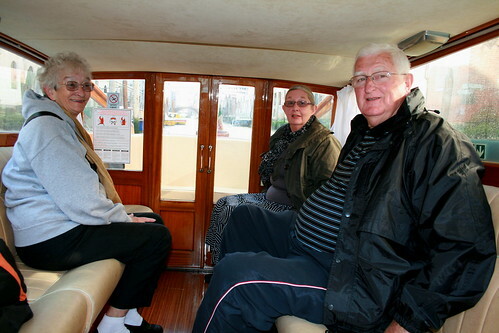 We also had an extra couple of passengers from another tour from our ship, i think they must have missed theirs! After getting back onto the ship, I had a spa before dinner, and then got ready for the dinner! I had a 'Surf 'n' Turf' and a Pinapple Parfeit (and a Banana Cream Pie). Our waiter, James, seems to think we are constantly hungry, as he is always bringing us seconds, be it appetisers, mains or mainly, desserts! Oh well, just as well as I am going back (heavier) to my PT when I get home! Tomorrw we are in Rhodes, another Greek Island. As I mentioned yesterday, due to various strikes in Athns, tours were cancelled and we were heading to Crete instead. Well now, Crete is cancelled as SOME of the strikes are now cancelled instead! But this only came through this evening! Now when we were finalising what onshore activities we were to do, the Athens tour had "Enquire Onboard", so I did. It was sold out! But the chap said that we could go on a 'wait list' (and as we were numbers 20-24, there is a likely chance of an additional tour). But with the cancellations and then the cancellations of the previous cancellations, ALL tours are now a goer! Are you keeping up?? If so, drop me an email as I am confused!! So what did we do today? Well, after breakfast (yumm) we went and had a look around the ship, up to the pool area, a walk around the jogging track and out to the very front of the ship! It was a little chilly and more than a little windy! So we headed back inside and mum went to have a rest, whilst Michael, Julie and I went up to have a look at the Chapel. This was very nice, non-denominational, but quite a nice touch! We then headed down to lunch (a never ending eat-a-thon on this ship I think) to the 'Windjammer' bar and restaurant. 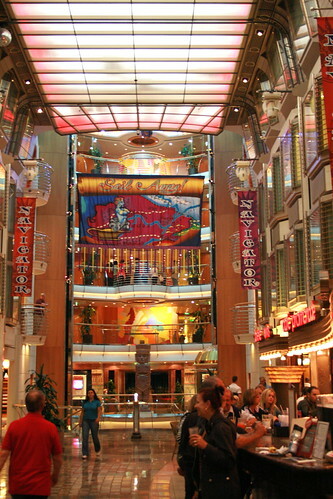 This is at the very back of the ship and offers a wonderful view of the ships wake! Needless to say, some more fantasticly YUMMY food! After lunch, mum went to a Scrapbooking class, Michael and Julie went to a History Lesson on Turkey and I went for a spa... Oh how I miss my spa! We then had to get ready for the 'Captains Dinner, a formal night of fancy dreses and suits. As usual, I felt like a fish out of water in my suit, but it had to be done! After dinner, see the pics HERE, we then headed into the Metropolis Theatre for the 'Now And Forever' Singing and Dance Show. There was about a dozen or so performers and was a hour non-stop of dancing and songs from Broadway, ABBA Mamma Mia as an example and the finale ABBA sequence was great! So tomorrow, we are (hopefully) off to Athens, so make sure you get to see those photos! 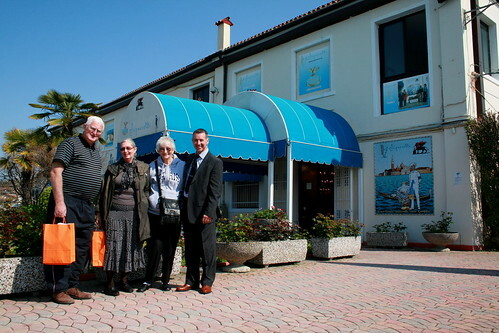 WOW, WHAT a day... We did Sorrento and Pompii tours today! (for ALL photos, look HERE due to limited time (and cost) for internet!). We first had a Dawn Service at 6.30am to remember our past lost soilders from Australia and New Zealand who landed in Gallipoli in 1915. It was quite a nice memorial, and I overheard the crew saying that they were originally going to have it for themselves, but on the passenger manifest they had so many of us (105 Aussies and 15 Kiwis), they HAD to do something a little more. We were greeted with Orange Juice and Champagne prior to the service (a little wierd, but a nice touch as they coldn't do it typically after due to breakfast and tours). A breakfast fit for a king was had, and a couple at our table had a much earlier tour than ours... Ours was the last out, so we could relax after an early start! 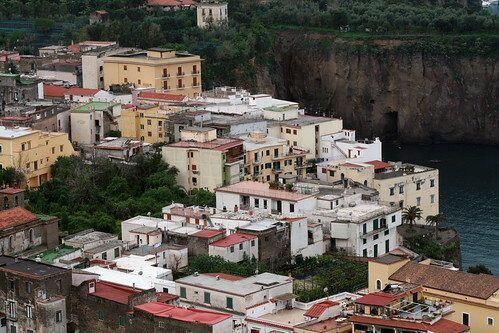 Our day took us out to Sorrento. It was an interesting bus ride, past Mt Vusuvious (Volcano that buried Pompii many centuries ago) through mountains, along cliff edges and around some very tight bends... 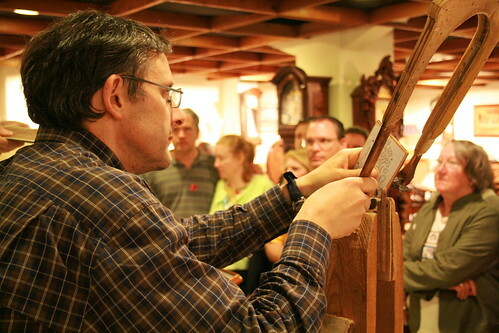 But we arrived at the Sorrento and had a quick demonstration in Inlayed Wood Working. It was vary interesting! 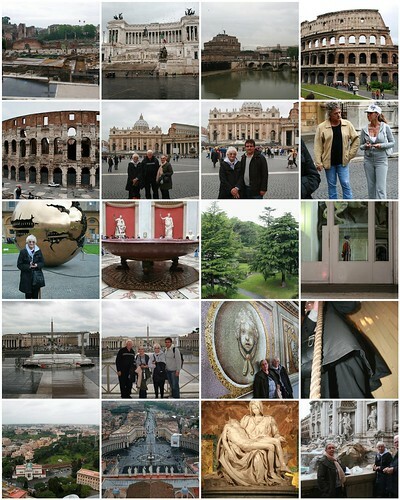 We then had some free time in and around the city before boarding the bus for Pompii. We also had lunch here, which was a quick and easy hand held as we kept exploring! Almafie Coast Sorrento, originally uploaded by AussiePomm. Cheese Tasting Plate, originally uploaded by AussiePomm. 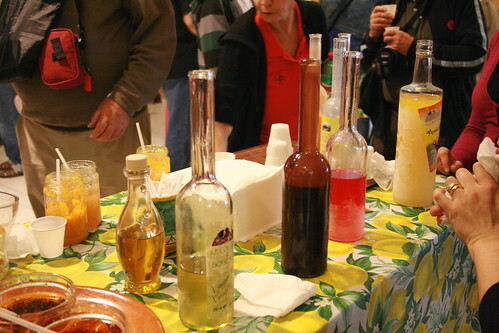 Flavoured Liquers, originally uploaded by AussiePomm. Inlayed Wood Working, originally uploaded by AussiePomm. Cameo Making, originally uploaded by AussiePomm. I actually had 40 winks inbetween, and we arrived in Pompii. 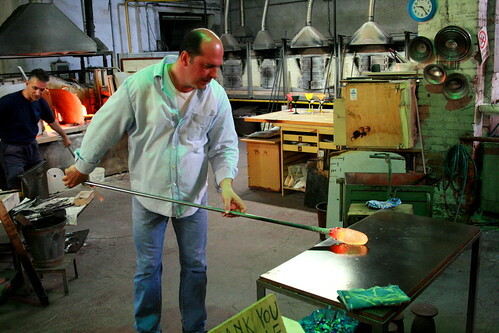 We were taken into the Cameo Making Factory, and I was truly blown away! I had never seen how these were made before, and I can now appreciate JUST why these things are so expensive! The workmanship in them is stunning! After this, we then headed into the Ruins of Pompii. I had no preconceptions what so ever, and I was in awe... These ruins are stunning, and sureal at the same time. 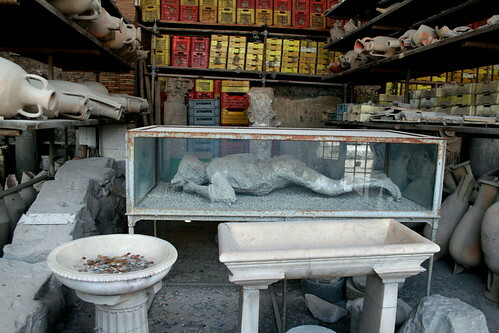 Seeing the plaster casts of how dogs and humans were found centuries after the explosion that buried the city, was the best. 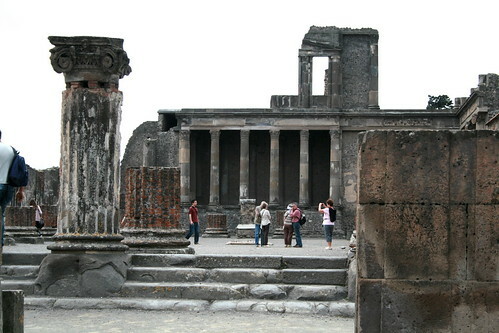 Pompii Ruins, originally uploaded by AussiePomm. Pompii Relics Human Cast1, originally uploaded by AussiePomm. 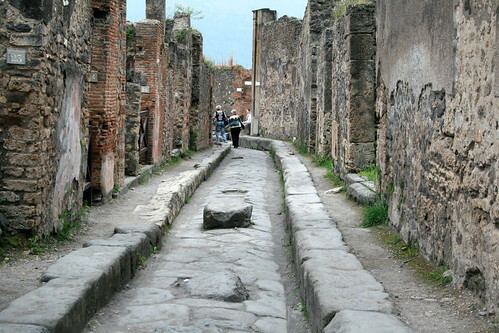 Pompii Road1, originally uploaded by AussiePomm. So now, we are once again sailing, but due to a strike in Athens, we may not get there. There are two causes, 1) is that the Union of Ministry of Culture WILL go on stike on Tuesday and as such most sites will be closed. Furthermore, 2) there is a possibility that the Athens Bus Drivers Union may also stike from Monday 26th through to May 8! As such, (if they both DO go ahead) we may be heading to Iraklion (Heraklion) Crete instead! So we will just have to wait and see what happens. Tomorrow is a day a sea, so not much will be happening, except for some rest and relaxation, maybe by the pool as sun is forecast! Today was our last day in Rome, and it was WET! Even wetter than yesterday! But we still made the best of it and we headed around the corner to the Basillica of the Angels. It was a very non descript looking building, and looked as though i had either been bombed or in a bad state of repair! But when we got inside, OH MY GOD, it was beautiful! Lots of marble on the floor and walls, ornaments and so on. They also had a lot of bits and pieces about Galilleo Galille! A couple of bits in particular was a story about physics and speed, how pendulums work and even how a hammer and a feather fell to the ground at the same time on the moon back in 1969 where the astronaught stated, "Gallileo was right"! We then head to our new favourite place in Rome; we had dinner the first night, lunch the second day and finally hot chocolate on the last day! Whilst it may seem as though we went all out first up, and then a little cheaper each visit, it was not the case! We then headed back to the hotel to collect our bags and wait to be collected for the trip to the port. It was about a 90 minute drive outside of Rome, which was a pleasant drive, what I can remember of it as I fell asleep (not being the driver of course!). We arrived at the port and had our bags taken by the porter and delivered to the room. We then headed through security and in no time at all, we were onboard and in our room! 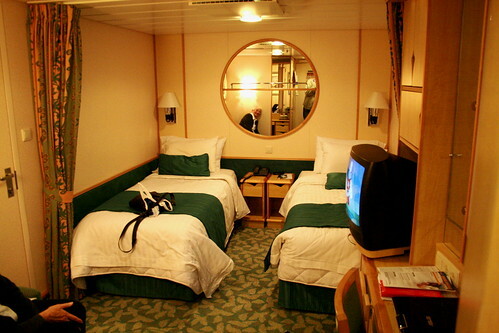 Nav Seas Room, originally uploaded by AussiePomm. We settled in and unpack our bag. We consolidated back in Rome and left a bag in the hotel as we are going back there for a night when the cruise has finished! We then did a little exploring before the Safety Drill occured. Nav Seas Grand Promonade, originally uploaded by AussiePomm. On Deck Nav Seas, originally uploaded by AussiePomm. We then started to leave the dock after the ropes were all released, when a taxi came screaming into the dock area. A younge chap got out and was directed to the check in area. Surely as we had already 'departed' we would not go back, but following him was a police car with lights and sirens on! He also went up to the check in area and from inside, both the young chap and a police officer carry an envelope we granted boarding... Must be important! So now, we have had dinner (one table back from a very large window) with a lovely couple from Rino Nevada, travelling with his mum and a wierd friend of hers (his words, not ours, but we did agree quietly!). It is 8.30pm, mum is in bed fast asleep whilst I am sorting out some last minute details. The ship is rolling slightly Starboard to Port and is really quite nice. One late update from the cruise director is that, due to a Turist Guide Strike in Greece (Athens) we may NOT go there... DAMN! But instead, we may go to either Crete or Malta instead! Day 22: - A wet look at Rome! We started the day with breakfast and it was still raining. It started a little last night between finishing dinner and to the hotel. But overnight, it was much more. Anyways, we marched on and got onto a hop on/off bus and were lucky enough to get upstairs first seat and under cover! We went all around which took about 2.5 hours and then went BACK to the hotel to get some warmer clothes on. It was cold and wet! 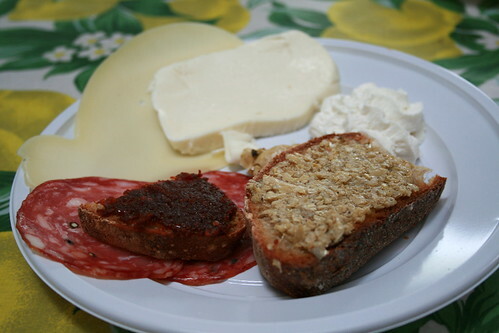 We then had some lunch, some hot sandwich’s, and then jumped back on the hop on/off bus to the Vatican City/St Peters Square. The rain had eased a little, but it was still cold! We were walking through when approached about a walking guided tour by a girl from London. It seemed very strange, we could try a short distance for free, and it seemed ok. But it really seemed strange when we ended up in a bar to pay for the tour and entry fee! Anyway, we threw caution to the wind, and paid our money (16 Euro) and we were on our way. She was very good, obviously enjoyed doing these tours and was passionate. Why we were worried I will never know! Rome St Peters Square PANORAMA, originally uploaded by AussiePomm. After the tour (2 hours) we (I really wanted) to head to the top of the Dome of St Peters. There was a lift, but it only went a sort way and from there, there was 320 odd steps. I knew that after the Duomo in Florence, this would be a breeze! I was so proud of the 'Grey Brigade' for doing it. The view, even through the rain, was magnificent! Anyway, the trip down (as in most cases) was nowhere near as hard and mum almost ran down. 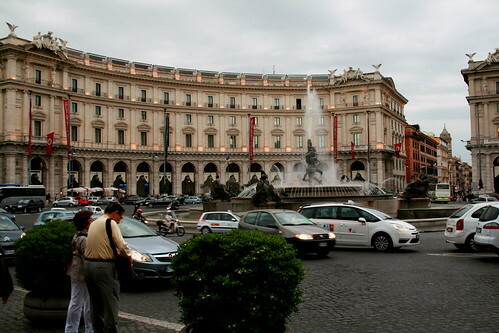 We then hit the souvenir shop and then to the Treve Fountain and dinner. Dinner was also great, I had a Mushroom Risotto, YES Mushroom, whilst Julie had Spinach Risotto, Michael Italian Sausages and Fennel and mum had Spaghetti Bolognaise! It was all VERY good, and not to badly priced! I am now back in the hotel, only person here, and then a group of German/Dutch maybe, people came in. There was plenty of space but they decided to literally sit on top of me! I fell as though my personal space is compromised... One lady, trying to sit near her partner, was SO close to me, I asked her if she would like to sit on my lap! I think she/they got the idea as they moved a few seconds ago when I was updating my FB status! Day 21: - Half way... A drive to Rome! WOW, we are half way already!!! I can't believe it really, as we have been on the go all of the time! If I had not been so busy with the conference and a couple of meetings here and there, I do not know WHAT or WHERE we would have been! Anyways, what did we do today? After a slightly (15 mins) later breakfast, we headed out into Florence to do some last minute shopping etc, and to visit the Palace which was also great! 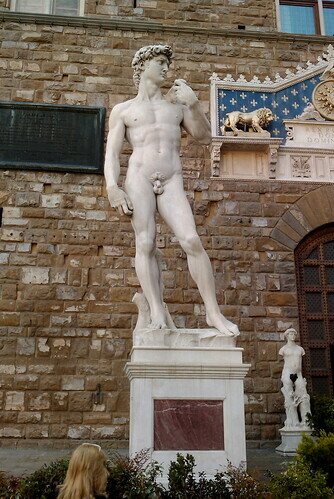 Infront of it is a (copy) of the statue David. 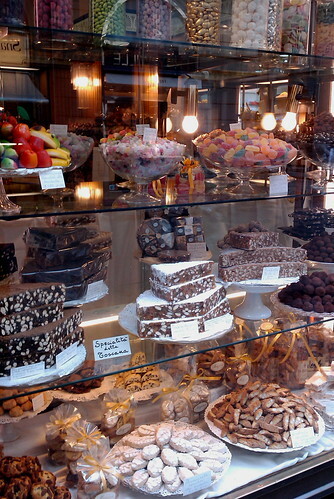 Florence Lolly Shop, originally uploaded by AussiePomm. 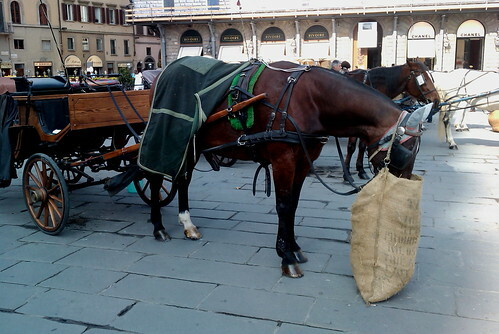 Florence Horse Chaf Bag, originally uploaded by AussiePomm. 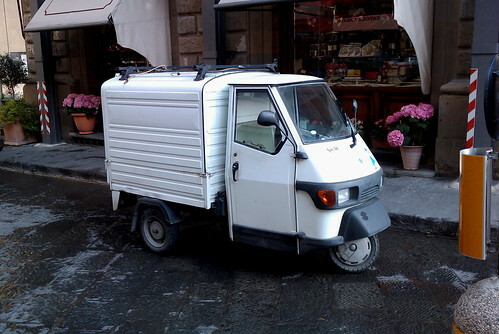 Florence 2 stroke van, originally uploaded by AussiePomm. Florence David, originally uploaded by AussiePomm. Inside was also great, but as I had packed my camera (David was from my mobile phone), other shots are not worth posting! 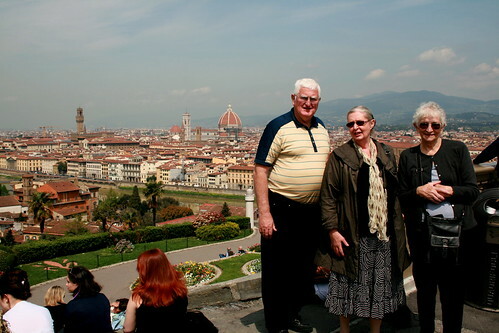 BUT, after checking out of the hotel, we headed up to the Michelangelo Lookout to have another look over Florence and some lunch before heading to Rome. Lunch at Michelangelo Lookout, originally uploaded by AussiePomm. 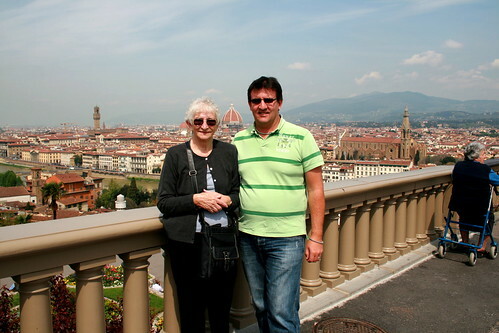 Mum and me Michelangelo Lookout, originally uploaded by AussiePomm. MJS AT Michelangelo Lookout, originally uploaded by AussiePomm. Once on the road, I literally fell right back into driving on the wrong side of the car/road. In fact, on the motorway, I even got up a fair speed of 155klm/h! I was on fire! 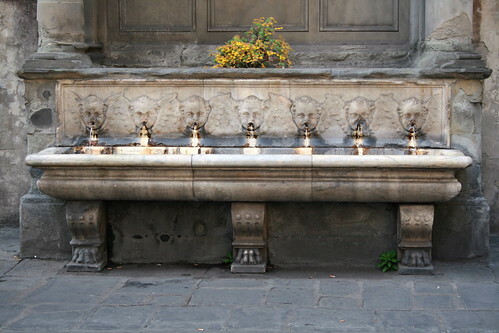 Rome, originally uploaded by AussiePomm. So, what will tomorrow bring? Who knows, but it will most likely involve a bus tour, a few visits to a couple of old places and the like... At least I dont HAVE to drive! 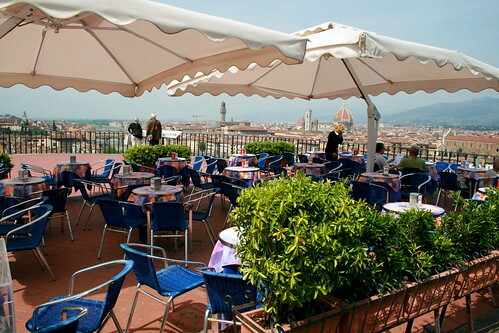 Today, we hit Florence in earnest... An early breakfast was waiting for us downstairs and then we were of to the S. Duomo. 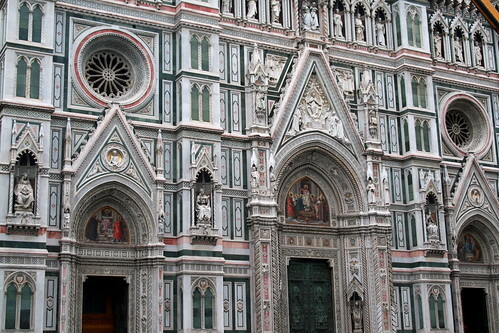 This is a Marble construction Basillica in greens, whites and red. In many ways, it is a little 'garish', but at the same time, I can appreciate its grandure! Anyways, it was not yet open, and they were doing some resoration works. But as we walked around the side, the acces to the top of the dome was open! Alas, I was the only silly body to go... BUT, I was so glad to do it as well! 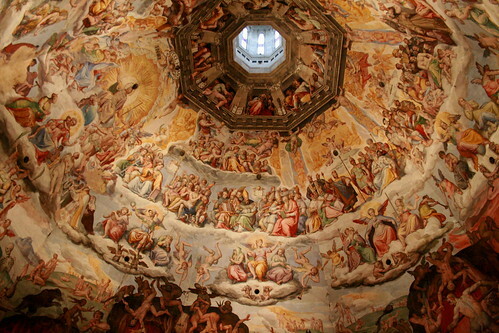 Duomo Florence, originally uploaded by AussiePomm. 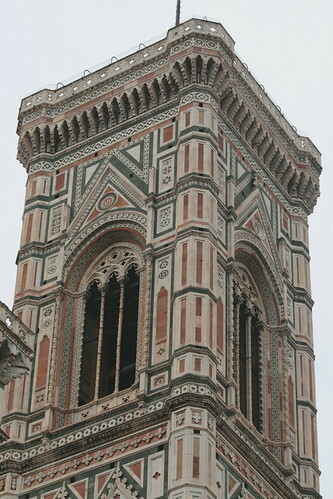 Duomo Tower Florence, originally uploaded by AussiePomm. Inside Dormo Globe, originally uploaded by AussiePomm. 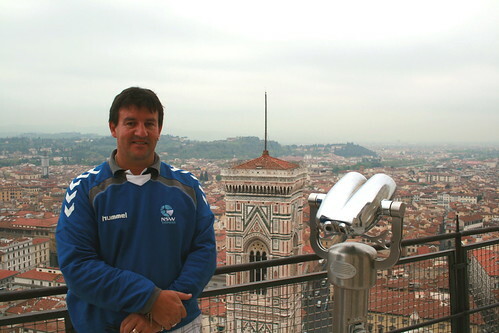 Me atop Duomo Globe, originally uploaded by AussiePomm. Duomo Pano, originally uploaded by AussiePomm. After climbing the 400 odd steps up, and back down, we headed off to do the hop on hop off bus tour. A tour that took 2 hours to go around. 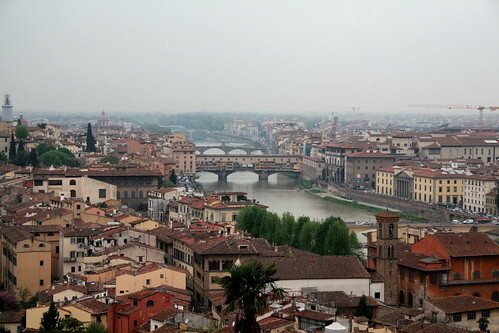 A highlight was a stop at the Michelangelo lookout which offered some amazing views. Pity it was quite hazy today! 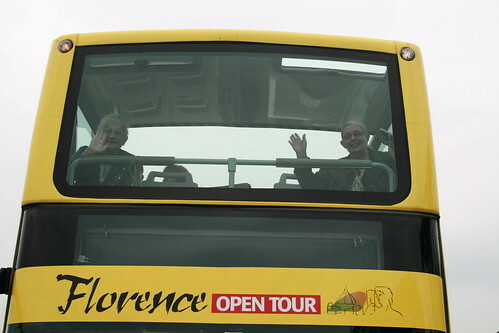 Mum and Julie Open Tour Bus, originally uploaded by AussiePomm. Ponte Vecchio, originally uploaded by AussiePomm. 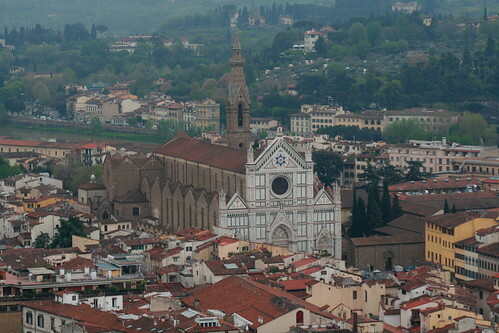 Santa Croce Florence, originally uploaded by AussiePomm. We then took to the streets to do some shopping, oh the markets here are up every day, and I got a leather jacket. I will have to get a photo later of it, but suffice to say, it was a good price, and its very nice! I almost didn't get it as I had walked out after disagreeing over the price, however, a final offer was accepted and the purchase was done! Abbey Road Attempt, originally uploaded by AussiePomm. Spitting Angels, originally uploaded by AussiePomm. 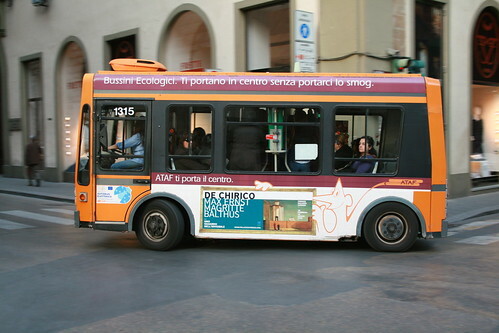 Florence ELECTRIC Mini Bus, originally uploaded by AussiePomm. 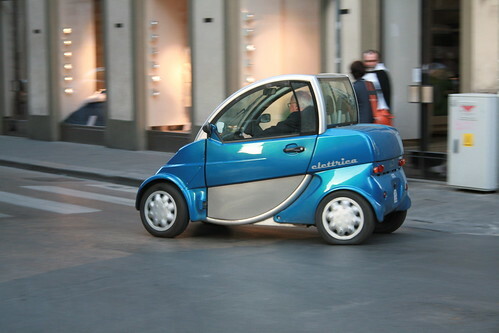 Funny little car, originally uploaded by AussiePomm. Pig Party, originally uploaded by AussiePomm. So, we are off tomorrow to Rome, again, driving on the wrong side... tee hee MB, but we are going back up to the Michelangelo lookout for a morning tea! For the last night in Venice, after dinner, we took in some of the bands that were plain in St Marks square... It was really beautiful in there, a cool night (no where NEAR as cold as earlier in the trip) and very peaceful! BUT, I alos wanted to get some night photography done as well! 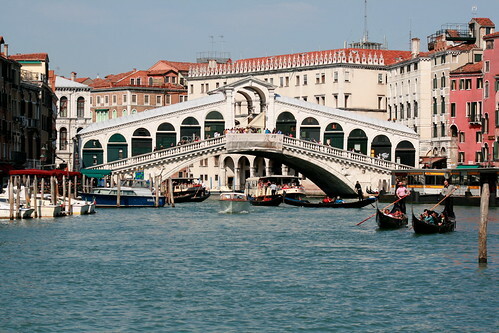 I walked back to the Rialto Bridge to get a couple. 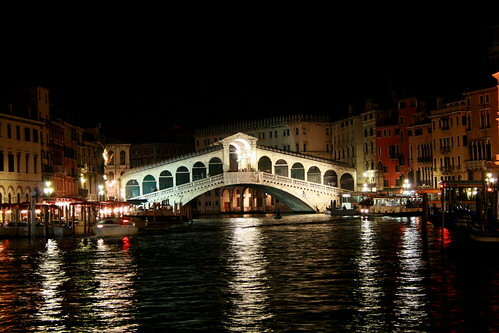 Rialto Bridge Night, originally uploaded by AussiePomm. 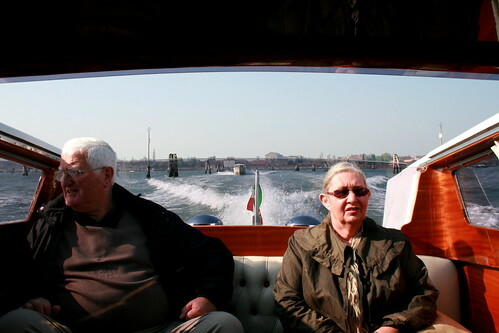 When we woke the following morning, after breakfast, we decieded to take the water taxi to the Airport to collect the car for the trip to Florence. On the way, we noticed that an Iberia A320 was on approach, so airlines were back in business! Taxi to Airport, originally uploaded by AussiePomm. Once we got the car, and I familiarised myself with the opposite to what I know,. It felt very strange for a little bit, but by the time I was going after about 15 mins, I was all good! I set the Garmin for Florence and we were off! Trouble was though, it took us OFF the motorway, to go through a toll, only to rejoin the motorway! Then it took me off an exit (even though Florence was straight ahead) only to find it wanted me to go where a road did not exist! So we did an extra 30 odd klm for nothing! 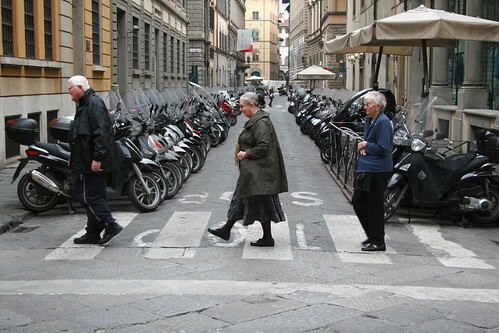 But the best was when we got into Florence as due to roadworks and some (more) recent one way streets, we ended up going around the block a couple of time with different back lanes until we finally got to the hotel... phew, it was over! So now, tonight, we had a cheap dinner of a couple of Pizza's, a bottle of wine and we are now in bed, well, the Grey Brigade are anyway! 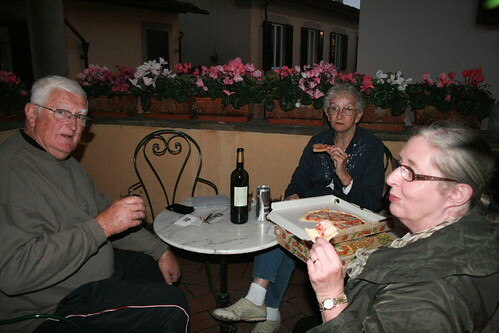 Pizza wine for dinner Florence, originally uploaded by AussiePomm. Day 13 ~18 Wrap up thanks to travelling and NO Internet! Man, it seems ages since I did a post... But it was not my fault, HONSET!!! Fitrstly our last day in Paris consisted of a bus tour of central paris and a trip Up the Eiffel Tour and the a trip up the Sein in a ferry (both were great!). 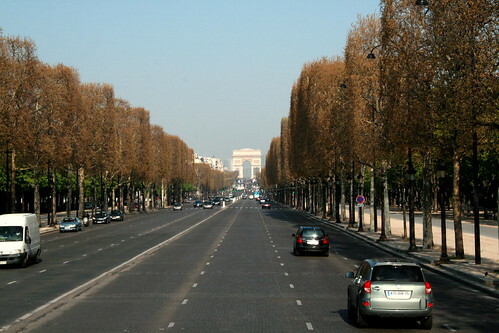 Champs Elysees, originally uploaded by AussiePomm. 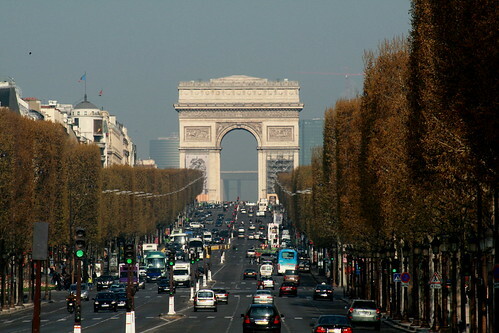 Arc de Triomphe, originally uploaded by AussiePomm. 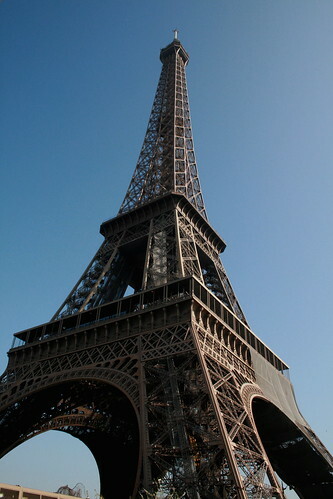 Eiffel Tour, originally uploaded by AussiePomm. 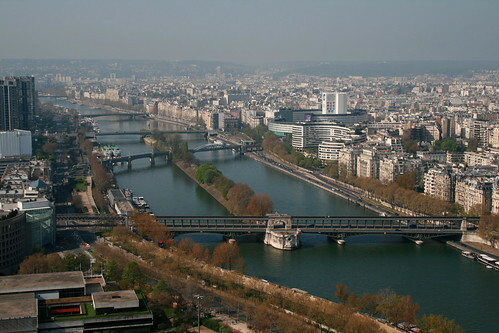 Paris Sein, originally uploaded by AussiePomm. 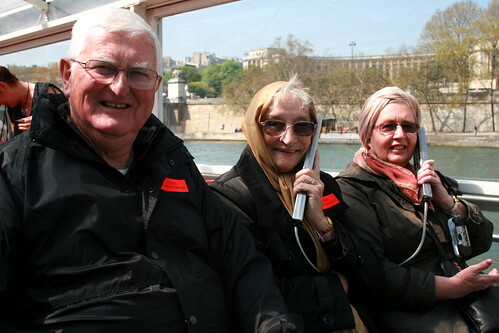 River Cruise Sein Paris, originally uploaded by AussiePomm. 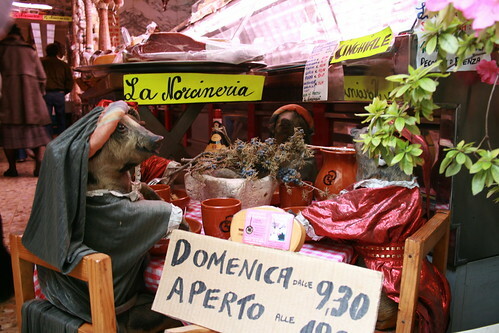 After this, we then caught the metro back to a station near the hotel, and guess what, there was an Antique Market... Both Michael and Julie were in heaven (me too, just quietly...). but it was all stuff I/we could not get back home very easily! It was an interesting trip, dinner in the coach car had the waiter balancing meals and serving, whilst we travelled through at a very brisk rate. We headed back to our cabin and adjusted the beds. I think I had the best nights sleep out of all of us! I must try and find what route we took, but when it was daylight (and an hour or so out of Venice) there was vinyards as far as the eye could see! 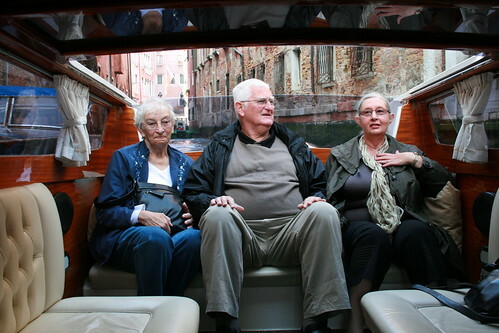 Now today, we were given a free trip across to the Murano factory... A water taxi arrived for us and it was a most enjoyable trip. And once across, we were taken into the blowing room, the showroom, both were amazing! I could not take any photos of the showroom, but rest assured, it was great! 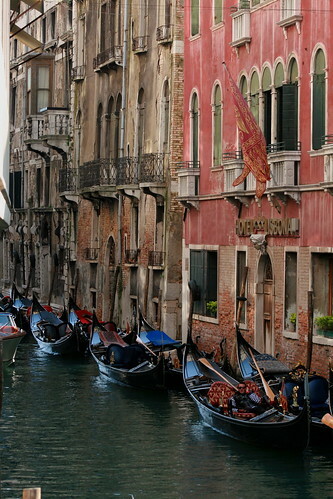 Venice Water Taxi, originally uploaded by AussiePomm. 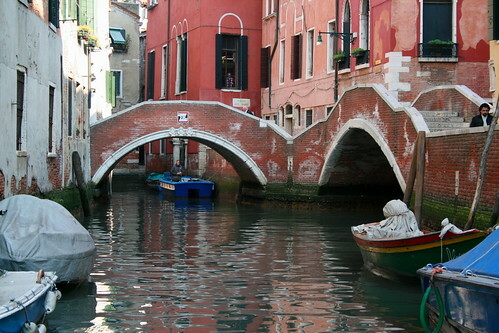 Venice Murano, originally uploaded by AussiePomm. 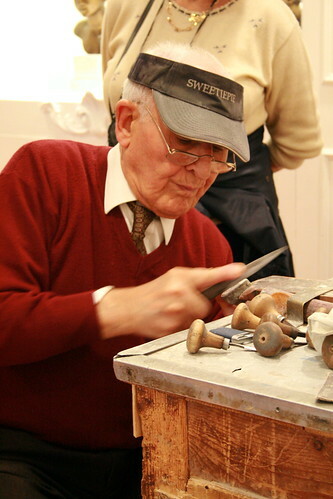 Venice Murano Purchases, originally uploaded by AussiePomm. Michael and Julie made some purchases, and when I got to the last showroom area, I found what I wanted, and made mine. So much for the 'free' trip hey! 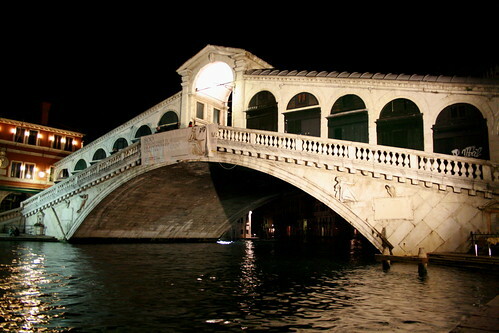 Rialto Bridge, originally uploaded by AussiePomm. Venice rand Canal, originally uploaded by AussiePomm. 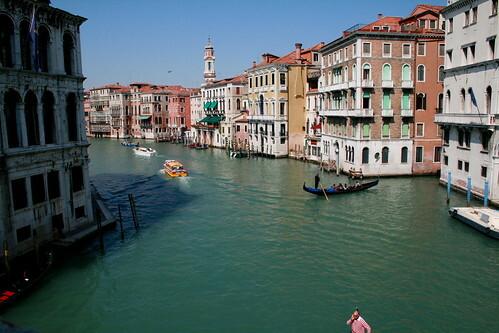 Venice Canal, originally uploaded by AussiePomm. Anyways, we are now up to date (sort of). Tomorrow we enter dangerous territory, when I pick up the car!!!! Driving on the wrong side of the road, in the wrong side of the car... Wish us luck! Day 9: - Portobello Road Markets and shopping! Day 4: - Wales, Castles and Bath!